This book summary is part of an ongoing project to summarise 35 books on Money and Personal Finance - for more, see the full reading list. There never seems to be anything left at the end of the month. Financial freedom is something you always promise you’ll think about tomorrow. How long could you live for if you stopped working right now? A year perhaps? A month? A day? This question is at the heart of Kiyosaki’s “Rich Dad Poor Dad”. And his answer? Don’t settle for average. Don’t settle for “I don’t know”. Don’t settle for less than forever. Wealth is not net-worth: your house, your car, your personal effects. Wealth is financial freedom: how long you could live if you stopped working today. Reduce the things that take it out again (liabilities). But what are these things? How do we find them? And, if it’s so easy, what holds us back? Good questions, replies Kiyosaki, and the answer, he says, lies in three things: Right motive. Right mindset. Right skills. True, most of us start from behind. In fact, most of us start with nothing. And few of us get even a basic financial education. But the good news, he counters, is that everything is in your power to change. Wealth building isn’t rocket science. Anyone can learn it. You’re in an accident. You wake up disoriented, tired, bleeding. Your car is upside down. Worse, you’ve landed on train tracks and, in the distance, a freight train is coming. And it’s coming fast. Do you waste time on how unfair the situation is? Do you wait for the train to stop? Do you wait for someone else to save you? Or do you struggle with every ounce of mangled muscle and spirit to break free? The answer is obvious. And yet we so frequently fail this test in life. “Our lives are a reflection of our habits”, says Kiyosaki. And he’s right. Be bold: Poor people are defeated by failure. Rich people are inspired by it. Be positive: Poor people say “I can’t do it”. Rich people ask “How can I do it?”. And take action: Poor people say “The rest of the world should change”. Rich people know “The only person I can change is myself”. Mindset is a collection of habits. Habits we can change. Broke is a state of bank balance. But poor? Poor is a state of mind. If you can learn to drive a car, you can learn to manage money. Sure, there’s lots to take in at first. True, you’ll make mistakes along the way – even as an expert. Yep, some trips under certain conditions may be riskier than others. And no, you can’t control everything all the time. But it’s not mysterious and it’s not impossible. You don’t need to be perfect right away. And if you learn the rules, practice enough, and keep a realistic eye on your abilities, nobody needs to get hurt. You can manage the risk. And the risk is worth the reward. Learning: Find new formulas. Learn them fast. Productivity: Don’t just do the thing right. Do the right thing. Self-knowledge: Know your weaknesses. Master your emotions. Accounting: Conquer cash, assets, and liabilities. Investing: Learn what to buy and what to sell. Markets: Sense when to buy and when to sell. Law: Know how to buy and how to sell. Sales: Negotiate like a ninja. Become immune to rejection. Deal-making: Don’t just find opportunities. Create them. Management: Empower yourself with good systems and people. Surround yourself with good people – Andrew Carnegie was one of the greatest businessmen of the 20th Century. Do you know what he wrote on his tombstone? “Here lies a man who knew how to enlist in his service better men than himself”. Learn from Carnegie. Shop hard for experts, advisors, mentors, teachers, friends, or even a best friend’s dad to inspire and inform you. Play games – Games are valuable tools because they speed learning with instant feedback. Like what you read here? Try Kiyosaki’s CASHFLOW; it’s free, online, and excellent. Investing in stocks? Try The Stock Market Game or any of the other free simulations and games you’ll find on Google. Attend classes and seminars – Some of the best investments I’ve made have been in online courses and seminars. Kiyosaki tries to attend at least two multi-day seminars per year. Short on time or cash? Learn for free, from the best, anywhere, any-time with Massive Open Online Courses (MOOCs) from the likes of Coursera, Udacity or Khan Academy. Love Wikipedia? Try Investopedia or BetterExplained. Find a job that will teach you – “Seek work for what you will learn, more than what you will earn”, advises Kiyosaki. It’s good advice. Shocking at sales? Take a second job in a Multi-Level Marketing company. Atrocious at accounting? Pick up part-time work as a bookkeeper. Lacking in leadership? Find a local club or organisation where you can get to work. Teach – Teaching forces you to tear a subject down, get to know every brick, and then show someone else how to put them back together again. There is no better to learn. “The more I teach those who want to learn, the more I learn,” claims Kiyosaki. After spending ~30h crunching his book into ~4,000 words – I can only agree. Effectiveness – doing the right thing. 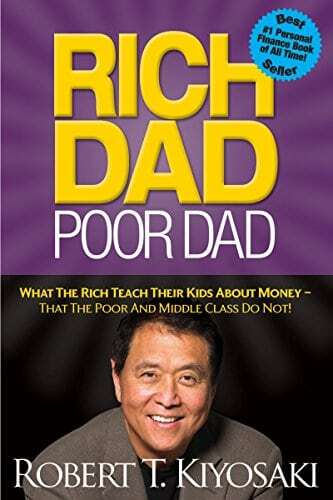 “Rich Dad; Poor Dad” is not a book on personal productivity but Kiyosaki does touch on its importance. Don’t be the financial equivalent of the guy that never has time to look after his health. Don’t bury your head in your job and pretend you’re doing the best you can. If financial freedom is something you want: make time for it. How? Kiyosaki doesn’t layer on the detail. You could, however, start much worse than with Chade-Meng Tan‘s excellent Search Inside Yourself. Accounting. Investing. Markets. Law. Gulp. I know what you’re thinking – but the hard part is actually over. Your salary is earned income (you working for money). An asset is anything that reliably puts cash into your pocket (money working for you). Cash created by assets is passive income. Cash spent on anything (including liabilities) is an expense. You are financially free when passive income exceeds expenses (at this point you no longer have to work, ever again). A recipe for financial freedom. The recipe for financial freedom is simple: buy assets to increase passive income; and reduce liabilities to minimise expenses. And the secret ingredient? Make converting your earned income into assets your top priority. Or in other words, always pay yourself first. Defer bills and expenses to the last possible moment. Let the pressure inspire your financial creativity. But always pay yourself first. One good approach is to automatically debit and invest a fixed sum from your account at the start of each month. Running short 30 days later? Remember, don’t say “I can’t pay”, instead ask “How can I pay?”. Financial intelligence is half method, half creativity. Accounting basics done – it’s really that simple. But if it’s so simple, where do we go wrong? The problem, Kiyosaki says, is that we often buy things we think are assets that are actually liabilities. Take your car, your television, or your other personal effects. How about your home? Do they regularly take cash out or put cash into your pocket? That’s right. They are all liabilities. Remember our simple idea? Wealth is not net worth. Sure, you might eventually make a profit on your home, but in Kiyosaki’s world – cashflow is king. If it doesn’t generate cash – it’s not a real asset. So what is a real asset? Anything else that has value, produces income or appreciates, and has a ready market. To illustrate, Kiyosaki gives concrete examples from his own preferred asset-classes: real-estate and small-cap stocks. His point is not that everyone should follow the same strategy, it’s to “inspire people to learn more” and “show that it’s not rocket science”. Learn what you buy – Risk is relative: “What is risky for one person is less risky to someone else,” writes Kiyosaki, “It is not gambling if you know what you’re doing. It is gambling if you’re just throwing money into a deal and praying.” If you take a sports car on to the freeway after one driving lesson, the risks are unacceptably high. How do you reduce them? With learning, practice, experience, and a constant dose of humility. Play with money you can afford to lose – When it comes to investing, you won’t win every time, or even most of the time: “On an average 10 investments, I hit home runs on two or three, five or six do nothing, and I lose on two or three.” explains Kiyosaki. Keep those odds in mind. If your home runs are the last of ten (or a hundred) investments you make, don’t lose your coat before you get there. One more thing. The best investment opportunities are often available first or exclusively to sophisticated investors. In other words, to get the best pieces of meat, you need to fight your way to the top of the food chain. That’s why “I constantly encourage people to invest more in their financial education than in stocks, real estate or other markets.” Knowledge won’t just make you a better player. It changes the game entirely. So find your niche. Learn it. Master it. Stay humble. Keep playing. Get smart → Grow rich. Warren Buffet describes Benjamin Graham‘s Intelligent Investor as “by far the best book on investing ever written”. The best part of the book? Graham’s allegory of Mr. Market – a simple story that explains everything Kiyosaki has to say on the market and more. Imagine you pay $1,000 to part-invest in a business with a manic-depressive called Mr. Market. Now imagine that every day Mr. Market calls you and offers to either sell you his share in the business or to buy you out. Mr. Market’s prices are constantly changing and often ludicrous; sometimes sky-high, sometimes rock-bottom. Do you think that Mr. Market’s daily moods have any impact on the intrinsic value of the business? Of course not. And the same goes for markets all over the world. That’s easier said than done; the pull of the crowd is strong. But it’s also the most valuable advice on understanding markets that you will ever hear. For more on Mr. Market, read The Intelligent Investor. Curious “why” markets can be so irrational? You’ll love Daniel Kahneman’s Thinking Fast and Slow or Nicholas Taleb’s Antifragile. Get to know the law. Why is the law so important? Because aside from interest and personal expenses, your biggest expense by far is tax. And when it comes to tax, the law is your only defence. At a minimum, you must find and use any tax shields your government makes available to you: 401(k)s in the U.S.; pension schemes and ISAs in the U.K.; whatever they are, wherever you are. If you’re not using them you’re losing them. “A corporation wrapped around the technical skills of accounting, investing and markets can contribute to explosive growth.”, says Kiyosaki. Assume my income is $1,000, my expenses are $500 and the tax rate for both individuals and companies is 20%. As an individual: My residual income is my starting income [$1,000] less my tax [$1,000 x 20% = $200] less my expenses [$500]. So, $1,000 – $200 – $500 = $300. In a corporation: My residual income is my starting income [$1,000] less my expenses [$500], less my tax [($1,000 – $500) x 20% = $100]. So, $1,000 – $500 – $100 = $400. In other words, I walk away with 33% more income in a corporation than as an individual. The real picture, of course, is more complex; but hopefully, you should feel motivated enough to go and fill in the blanks. Sales, deal-making, and management are among the most rewarding and exciting skills you will ever add to life’s toolbox. And the good news? They are nowhere near as hard as you think. Yes, selling is scary. Yes, it’s demoralising. And yes, that is exactly why you should do it. I was terrified of selling. So I spent the first two years of my career cold-calling executives to sell financial products. After months of rejection, I somehow convinced the CEOs of Turkey’s 5 top steel mills to meet with me. When I arrived in Istanbul, age 21, cheap polyester suit, all gelled hair and Labrador energy, did they welcome me? They barely contained their laughter. It still makes me wince. Do I regret it? I can’t point to a single other professional experience that had so great a positive impact on my life and work. My favourite books on sales are Brian Tracy’s Psychology of Selling, Roger Fisher’s Getting to Yes and Robert Cialdini’s Influence: The Psychology of Persuasion. And remember: “A person’s success in life can usually be measured by the number of uncomfortable conversations they are willing to have.” — Tim Ferriss. The first step to finding opportunities is to look for them. And looking gets easier if you learn and surround yourself with smart people. “Look for someone who wants to buy first, then look for someone who wants to sell.” Investors call this arbitrage. Use your learning to close gaps between buyers and sellers. Though rare, there’s no better way to make good, quick, risk-free money. “Make lots of offers” In fact, always make offers, even if they’re stupidly low. And make them with escape clauses – “subject-to” contingencies, even if only subject to the agreement of an imaginary business partner. You’ll be surprised how often even an insultingly low offer might be accepted. Though light on details, Kiyosaki’s examples often include some form of peer-to-peer lending or other bank free financing options . If you want to find answers – go and look for them. I’d start with Google. Still stuck for ideas? Go back to the learning section of this article and don’t come back empty-handed. Remember Andrew Carnegie? “The real skill is to manage and reward the people who are smarter than you in some technical area,” confirms Kiyosaki. Finding good people is one of life’s toughest challenges. The secret? To find people who’ll shop hard for you, you must shop hard for them. One final tip from Nike founder, Phil Knight: “don’t tell people how to do things, tell them what to do and let them surprise you with their results.” If you’ve truly surrounded yourself with people more intelligent than yourself, the surprise will nearly always be pleasant. Learn to find, lead, and organise good people. This one tip alone won’t just make you rich. It will change your life completely. “If most of you can cook a better hamburger, how come McDonalds makes more money than you?” asks Kiyosaki. So how do we get better at managing systems? Kiyosaki restates the importance of “work to learn” over “work to earn”. Jump at chances to work in different parts of your organisation, even if it means deferring a promotion. The long-term benefit of understanding the many working parts of a business will far exceed any short-term loss of earnings. My own advice? Pick up a copy of David Allen’s Getting Things Done and Ferriss’s The Four Hour Work Week. You’ll find no better introductions to personal and small business productivity. Rich Dad Poor Dad packs a huge amount of know-how into its 178 pages. And wherever the “how” feels light, Kiyosaki never fails to point out “where” we search for more answers. Fear and greed enslave us all. They keep poor people poor through overspending and debt. They keep rich people miserable through 80+ hour weeks long after they’ve become financially free. Sure, a little greed can be a useful spark in our quest for financial freedom. Vital even. But what use is financial freedom if it costs you your mind, your body, and all the things that you love? So get to work. 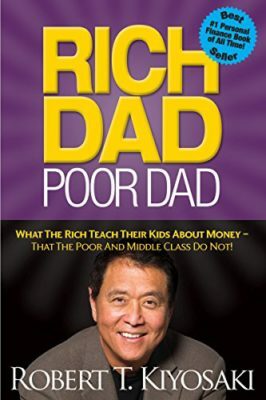 Read “Rich Dad Poor Dad”. Take a free course in investing. Find good people. Ask great questions. Resolve to pay yourself first. Perhaps your dream is to travel. Perhaps it’s to spend more time with your children. Perhaps it’s to go out in the world and make a difference. It doesn’t really matter what you choose. Just remember: freedom without happiness isn’t really freedom at all. And the most valuable thing that money can buy you is this: To be happy, to be free, and “to be you, full-time.” — Phil Knight, founder of Nike.